During the past year I have 'sanitized' my collection of Kate Bush singles. The ones I had - and which were featured on this blog - were often damaged and/or in damaged sleeves. As a Kate Bush fan, that wouldn't do, so I have bought new copies of most of them by now. There's still a handful missing, but I am almost satisfied that I have good UK, Dutch and German copies of those singles now (and even a few French ones!). 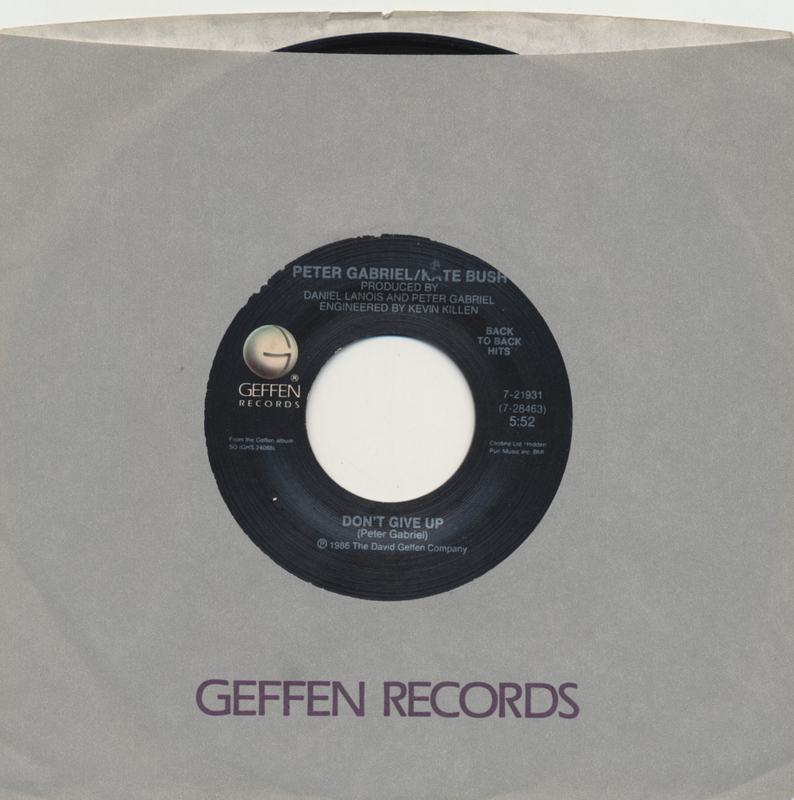 While looking for the last few, I found this American single, featuring 'Don't give up', the famous duet with Peter Gabriel, backed with Gabriel's 'Big time'. It is a re-released 'oldies' single in the 'Back to back hits' series. No-one knows when this single was released, apparently. I couldn't resist buying this little gem. 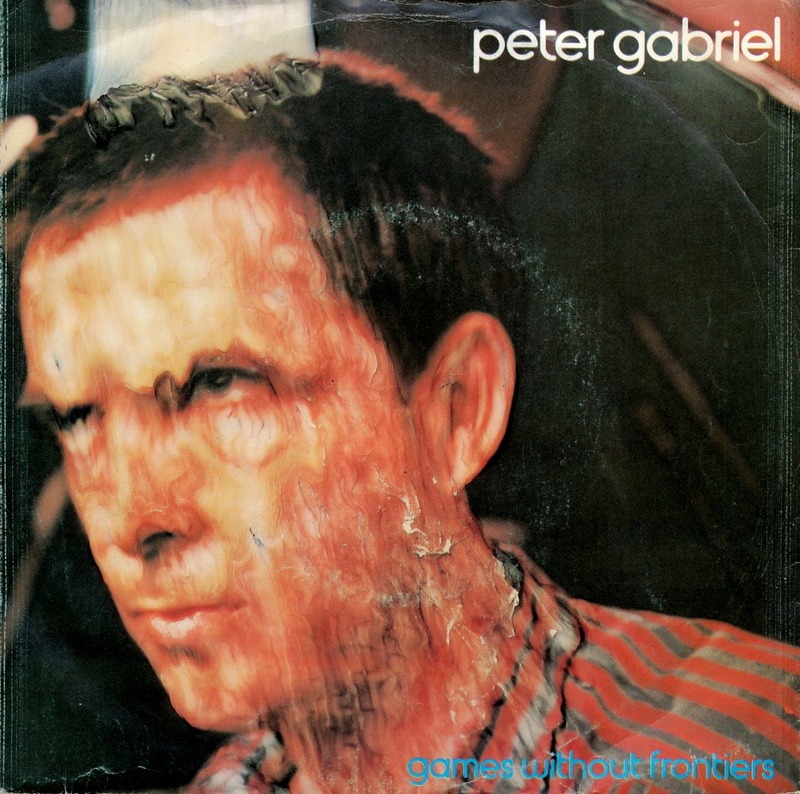 Although I do have a single with Peter Gabriel's 'Games without frontiers' on it (see it here) I really wanted to have the original single as well. So here it is, in all its weird glory. There was a bit of excitement recently when a compilation album of Eighties 12" remixes - you know the ones - suddenly included a rare remix. 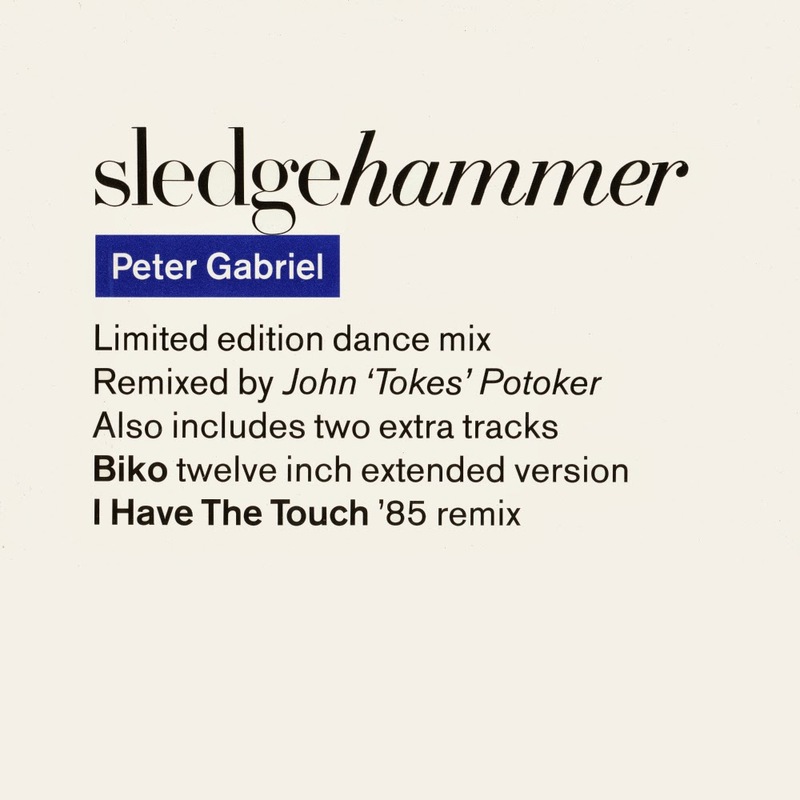 It was the dance mix by John Potoker of Peter Gabriel's 'Sledgehammer', released only once previously on this limited edition 12" single. The regular 12" single simply contained the album version of the track, so this remix was a bit of a rarity. Peter Gabriel released 'Peter Gabriel plays live' as his fifth album in 1983. The album was originally released as a double album and longplay cassette, with sixteen songs and a running time of over 80 minutes. It was eventually issued as a double CD set, and, in 1985, as a single CD version 'Plays Live – Highlights' with only twelve songs and some significant track time alterations. 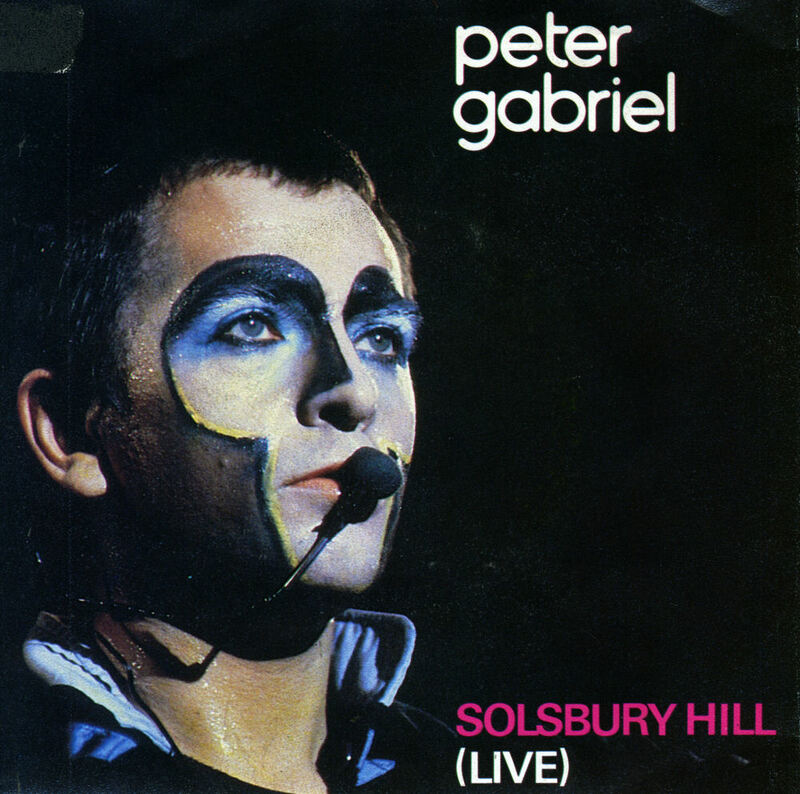 This live version of 'Solsbury hill' was lifted from the album for a single release. It was not a hit, but apparently it inspired Sarah McLachlan to record a cover of this song a decade later. 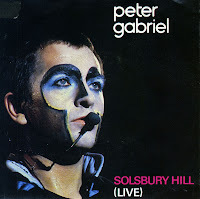 'Solsbury Hill' was written by Peter Gabriel after he left the and Genesis. Released as his debut single, it allegedly explains the reasons behind his departure, while also talking about a spiritual experience atop Solsbury Hill in Somerset. The song has been used in a number of movies like 'Vanilla sky' (2001) and 'In good company' (2004). The song has been covered by various artists, such as Dave Matthews, Erasure, Sarah McLachlan, Saga, and Justin Hines. I first heard Peter Gabriel's 'Shock the monkey' as part of a compilation album for Greenpeace, released in the mid-Eighties. That compilation was remarkable for its inclusion of Kate Bush's 'Breathing' - the single version no less. 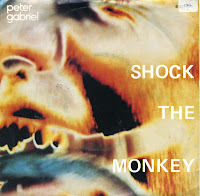 I never actually knew 'Shock the monkey' was released as a single, but that's mostly because it was not a hit in the Netherlands. 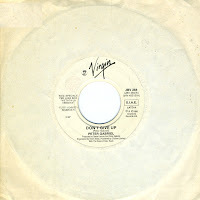 Released in September 1982, it reached number 58 in the UK singles chart. The Italian promo single is a strange phenomenon. There are several in my collection, and without exception they are white label promos, released in a custom white sleeve, with two A-side tracks from different artists on them. In this case: 'Don't give up' by Peter Gabriel and 'In too deep' by Genesis. I'm not up on Italian chart placings, but it's safe to assume that both singles were a hit in Italy. What's interesting about this single is that in a way it reunites the old line-up of Genesis. But that's a rather pointless observation. It's a nice collector's item for fans of Genesis, Peter Gabriel... and Kate Bush of course. 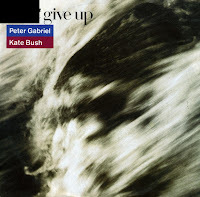 'Don't give up' was not Peter Gabriel and Kate Bush's first collaboration, but it is arguably their best. The song was recorded for Gabriel's 1986 album 'So'. The lyric describes the despair of a man who feels that the economic system has no place for him, seeking council and support from the words sung by Kate Bush. Godley & Creme directed two videos for the song: the first consisted of a single take of the singers in an embrace, as the sun enters total eclipse and re-emerges. The second featured Gabriel and Bush's faces superimposed over film of a town and its people in disrepair. The single peaked at number 9 in the UK singles chart and number 4 in the Dutch Top 40. Peter Gabriel released his debut solo single in 1977, after leaving the band Genesis, of which he had been the lead singer since its inception. Gabriel actually wrote the song to explain his reasons for leaving the band. The single reached number number 13 in the UK and number 11 in the Dutch Top 40. On the other side of this 'Old gold' re-release single is the 1980 single 'Games without frontiers'. This track features Kate Bush on backing vocals: she sings 'Jeux sans frontières' (It took me some years to find that out...). The lyric of the song is a critique of nationalism and war, which the song portrays as essentially childish. This single was Gabriel's second hit, peaking at number 4 in the UK singles chart. 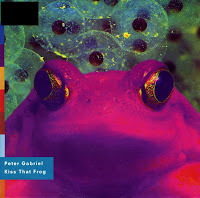 'Kiss that frog' was the fourth single taken from Peter Gabriel's 1992 album 'Us'. 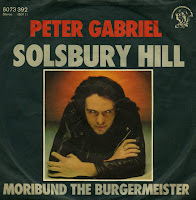 Produced by Peter Gabriel and Daniel Lanois, the track was a bit of a messy affair, reminiscent of earlier singles by Gabriel, but not quite as effective. The single only managed to reach number 46, and as a result, no further singles were taken from the album. 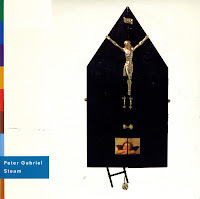 'Steam' was released as the second single from Peter Gabriel's 1992 album 'Us'. Peter Gabriel has said that the song is about a relationship in which the woman is sophisticated, bright, cultured, and knows everything about anything and that the man knows nothing about anything, except, he does know about the woman, and she doesn't know much about herself. In a way, 'Steam' does take the listener back to the sound of 'Sledgehammer', and the video even reminds of that video as well. It became Gabriel's last top 10 hit in the UK, peaking at number 10. In the Netherlands, the single reached number 16. The soundtrack of the motion picure 'Philadelphia' contained a famous Bruce Springsteen track, 'Streets of Philadelphia'. 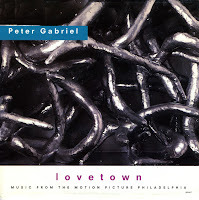 But strangely enough it is less well known that the soundtrack also contained a new Peter Gabriel track, entitled 'Lovetown'. That's unfortunate, because the track is simply mesmerizing. The single only managed a number 47 placing in the UK, and did not chart in most other territories. 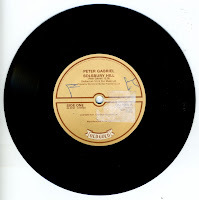 The B-side was taken from Peter Gabriel's then-current album 'Us'. 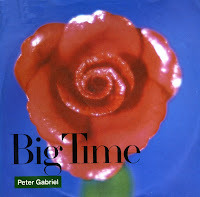 Peter Gabriel's song 'Big time' is often compared to his previous hit 'Sledgehammer', because both tracks are uptempo, both come from the same album 'So' (1987) and both were promoted by music videos that used several animation techniques. Still, 'Big time' was not the big hit 'Sledgehammer' was. In the Netherlands, 'Big time' peaked at number 24 and in the UK it reached number 13. 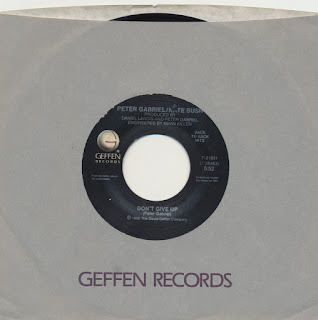 It was the first Peter Gabriel single that was also released on the new cd-single format. The song deals with a man's efforts to achieve success - but his vision of success is quite peculiar and naive. 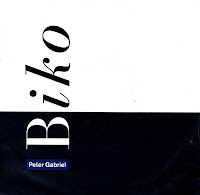 'Biko' was originally recorded in 1980 on Peter Gabriel's third solo album. The song was about Stephen Biko, a noted black South African anti-apartheid activist. Biko had been arrested by the South African police in late August 1977. After being held in custody for several days, he was interrogated in room 619 of the Walmer Street prison in Port Elizabeth, Eastern Cape. Following the interrogation, during which he sustained serious head injuries, Biko was transferred to a prison in Pretoria, where he died shortly afterwards, on September 12, 1977. 'Biko' was re-released in 1987 to draw attention to Sir Richard Attenborough's film 'Cry freedom'. This live version was recorded at the Blossom Music Centre, Cleveland, 27th July 1987. 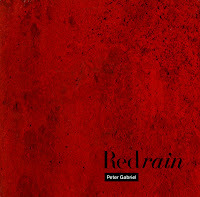 'Red rain' was the third single released from Peter Gabriel's multimillionselling album 'So' (1987) . The song is a combination of several inspirations. The lyric directly reference a recurring dream Gabriel was having where he swam in his pool drinking cold red wine. According to the sleeve notes from the remastered version of 'So', it is also a reference to acid rain. The single peaked at number 46 in the UK singles chart, which meant that it did considerably less well than the previous two singles 'Sledgehammer' and 'Don't give up' (the duet with Kate Bush). 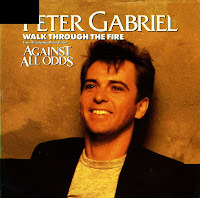 Peter Gabriel contributed the track 'Walk through the fire' to the soundtrack of the 1984 movie 'Against all odds'. It's interesting to note that other Genesis members contributed to the soundtrack as well: Mike Rutherford contributed the song 'Making a big mistake' and Phil Collins recorded the well-known title track. It's interesting how little is known about this track by Peter Gabriel: I couldn't find any background information about it on the web. I did find out that it peaked at number 69 in the UK. So not a big hit, then. Peter Gabriel released his sixth studio album 'Us' in 1992, six years after his previous album 'So' . The first single was 'Digging in the dirt', an intricate song but a slightly understated affair after all the bombast of 'Sledgehammer' and 'Big time'. The song was an exploration of the issues in his personal life at the time - the end of his relationship with Rosanna Arquette, his desire to reconnect with his daughter and even the self healing he was looking for in therapy. On the B-side there was a beautiful silent version of the album's next single, 'Steam'. 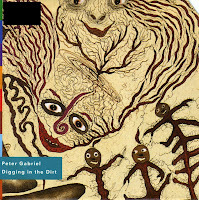 'Digging in the dirt' peaked at number 24 in the UK and number 30 in the Netherlands. I bought this single on discount and found a nice boxed edition of the cd-single years later. If you think Peter Gabriel and Kate Bush worked together for the first time in 1986 when they recorded 'Don't give up', you wouldn't be alone in thinking that. But in reality, they got together as early as 1979, when Kate Bush recorded a television special for UK television. They sang 'Another day' together, and Gabriel performed 'Here comes the flood' solo in this special. 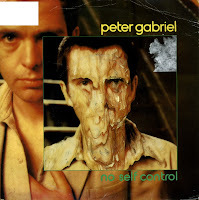 In 1980, Peter Gabriel recorded his third solo album. Kate Bush provided backing vocals on the tracks 'Games without frontiers' and 'No self control'. It might be a coincidence, but both tracks were released as a single in 1980. Being a Kate Bush fan, I had to have these singles, so I was very glad when I found a reasonably good copy of 'No self control' in 1995. 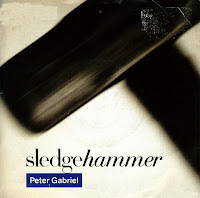 Peter Gabriel's 'Sledgehammer' will always be remembered mostly because of this video. It was directed by Stephen R. Johnson. Aardman Animation and the Brothers Quay provided claymation, pixilation, and stop motion animation that gave life to images in the song. In 1987, it won nine MTV Video Music Awards, a record which still stands today. It ranked at number four on MTV's 100 Greatest Music Videos Ever Made (1999). MTV later announced that 'Sledgehammer' is the most played music video in the history of the station. The lyric of the song contains thinly-veiled sexual innuendo, which was common in soul music from the 1960's, which the song was influenced by. The lyrics include phallic references such as a steam train, bumper cars, a Big Dipper (roller coaster) and a fruit cage. It also includes references to the sexual reproduction of plants, mentioning pollination, fruit and bees. I bought this single a decade after it came out. At the time of its chart ascent, the song was played so often on radio and television that I thought I would never play this record anyway. And I was right. I still haven't played it much. 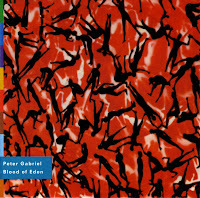 A year later, 'Blood of Eden' reappeared as a track on Peter Gabriel's album 'Us'. This time, it was performed as a duet with Sinéad O'Connor. It was this version that got a single release. It reached number 43 in the UK singles chart in 1993.